This is the second time the London Strobist group has organized a shoot at Club Life. It's a very cool place under the bridge in Vauxhall, London. So I kind of knew the place and where I would like to shoot but then I saw Tim Saunders shooting Vik Moreno standing at the bar. Tim and I met each other at the LPMG as we have held some photography workshop, Tim is a very keen on environmental portraiture. So I was curious to see how the pictures would come up and was really impressed. The chosen location was great, the bar table was shiny so Vik was reflecting onto it. Even though the background was very far away from us we couldn't get it to go black because it was made of metal and would reflect back all the light from the flashes. But this was actually good as it made the background more interesting. As the Tim continued to take great shots, I was studying how Vik was posing and the more I look at him and at the pictures from Tim's camera, the more I felt that Vik would be great for my espionage project, he has a certain class, looking both charming and strong. 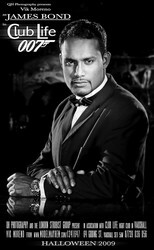 Exactly the feeling of a real James Bond character! But something in me was shouting "black and white"! So I changed my Nikon D300 to Monochrome and started to shoot few test shots. Tim was using a hotshoe softbox as key light on camera left and a second bare flash as hair and rim light at camera right behind Vik. Even though it is a great setup, I wanted more! So I suggested that we add my flashguns into the setup and set a SB-600 as second hair/rim light on the left behind Vik. But I would not use the softbox as a key light but as fill light! Yeah for a change. I planned to use a very harsh light source for Vik's face for a more virile look. So it will cast strong shadows. For my key light I used an SB-900 mounted with a grid spot to create a soft edged beam of light on Vik's face. All the rest of his body would be in the darkness. So the soft box would be used to fill in those shadows. First I started to expose for the shadows by turning on just the flash that is in the softbox. Then I switch on the key light and exposed for the face and part of the shoulders. 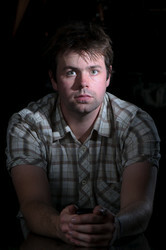 The softbox was set to a power that is just enough to bring details to the darkest area of the subject. This to ensure that nothing would go darker than what I set it to be. The effect of the gridded key light was exactly as I expected it to be, harsh shadow on the side, gradually going darker as the light falls off down the subject's body. Then I added the two hair/rim lights at the back to detached the subject from the dark background and give a crisp 3D effect. Yay! Love it. I love Nikon CLS (Creative Lighting System) combined with AWL (Advanced Wireless Lighting) it allows me to trigger Nikon flashes remotely and wirelessly from my D300 without buying any additional gadget. The issue using the D300 on-board flash to trigger external flashguns is that I can only control two groups of lights and thus assign only 2 power settings to them. So in this scenario I set my key light to group A and my fill light to group B. How to deal with the rim lights now?! I set them to group B too. As they are bare they will deliver more power than the flash through the softbox at same distance. And if I need to adjust their power I would only have to move them closer or further away from the model. Simples! squiuiiiiickkk (sound of a meerkat). So from the D300 I will control the power of the set of flashes and start some quick test shot until I get the light I want and then start to pose Vik. It's now a matter of tweaking the shot. when would you use Gobo's on the rim lights? Did you use gobos here? How do you know when you need them or not? You raised a very good point that I forgot to mention in the post. Thanks. I guess you are talking about the flash pointing directly at the camera creating a flare or sort of veil of light covering the image? 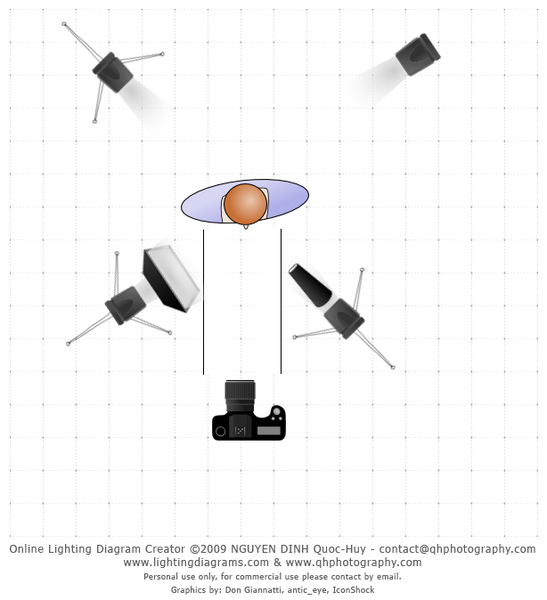 You can avoid this either by, as you said, using a gobo to block the light from the flash to reach your lens or by moving the flash further away from the subject and change its angle so it will be less pointing towards the camera. Then zooming the flash to a higher value will tighten the beam of light and help with the flare as well. For this shot I did not use any gobo, firstly because I don't often bring them with me and ask my assistant to use his/her hand as a gobo or use change the position and angle of my flash. 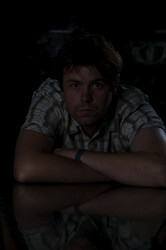 And also in this case the softbox was also acting as a gobo and hide my camera from the rim light on the left. The one on the right was clamped much on the side and tilted down. So the horizontal and vertical angle was good. "How do you know when you need them or not?". Well usually when I see the flare when chimping :-D but you can predict a flare when the flash is pointing towards the camera.